I’ve had a Yahoo! account since 23rd September 2000. Nearly 7 years. In those 7 years, I’ve sent a whopping 80 messages using it, 4 in 2007. (For comparison, in the 2 years I’ve had a Gmail account, I’ve sent 103.) However, I get about 50 – 100 e-mails a day. 90% of them being spam and the others being newsletters or automated junk. At 10 AM today, I recieved an e-mail through my Yahoo! account — that I just happened to notice through the Messenger popup, otherwise it would have gone unread for a week — thanking me for being a “Yahoo! Power Mailer”. I will admit, for a while, Yahoo! was my primary account. But, their spam filters are royally lacking and I get a large quantity of spam because of the age of my account and the wide sales of that e-mail address. So, spam filtering is a major concern. So, I’m being rewarded for being spammed and having suffered with near useless spam filters? I suppose that does deserve a little compensation. And that’s what this is, a LITTLE compensation. What have I gotten? 10 more megabytes of attachment space within an e-mail (that I don’t even use in the first place). The 24 hour support is a crock, because, if the service isn’t working like it should, support over IM isn’t going to fix the problem faster. Kind of like dialing 911 to report a loud party instead of using the non-emergency number. 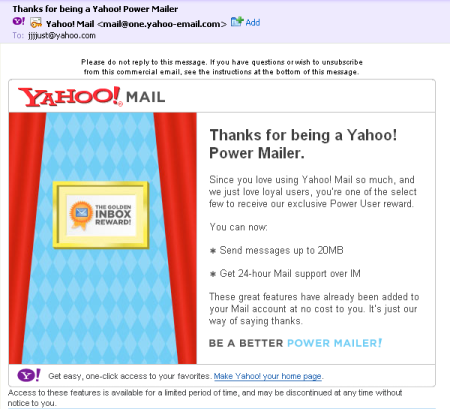 And if I’m a “Power User” like they say, I shouldn’t need basic “How do I forward an e-mail?” help. But, hark, a notice at the bottom: “Access to these features is available for a limited period of time and may be discontinued at any time without notice to you.” So, in one paragraph I’m a loved “loyal user” and in another, I might not even be worth notifying if you guys decide to change your minds. I’m going to frame my Golden Inbox Reward and even put in the “Be a Better Power Mailer!” bit. It’s quite inspirational really. You too can prosper through being spammed. This entry was posted on Saturday, August 25th, 2007 at 11:13:34 AM	and is filed under Internet, Technology. Tagged: Yahoo!, Yahoo! Mail. You can follow any responses to this entry through the RSS 2.0 feed. You can leave a response, or trackback from your own site.